Buy Ouray Ice here and save money versus purchasing from within our app via Apple or Google. It’s exactly the same guidebook, but offered at a lower price on rakkup.com. 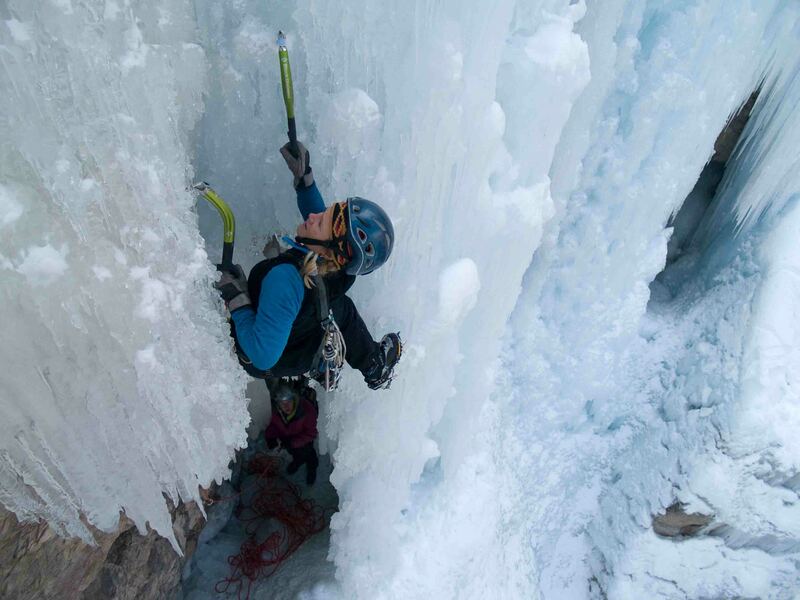 Ines Papert at the Ouray Ice Park. 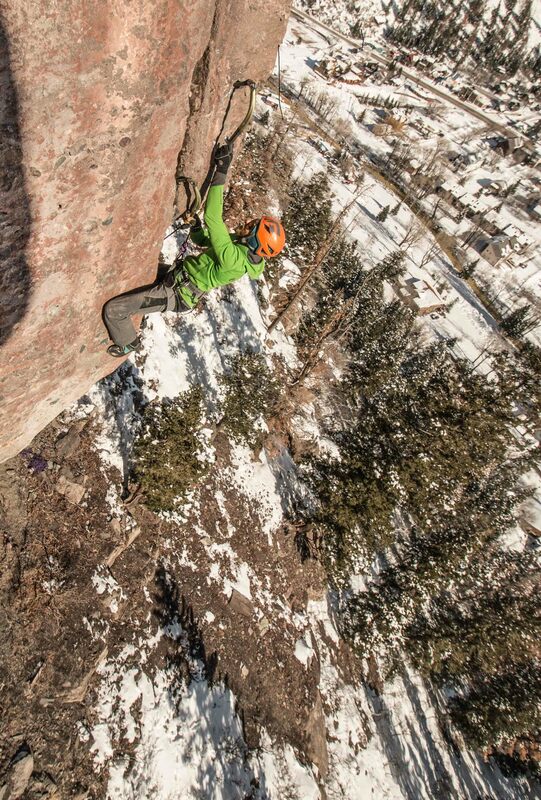 Rock and Ice Magazine once came out with a statistic that Ouray had more climbers per capita than any other US city. I’m guessing they came up with that number during ice climbing season. 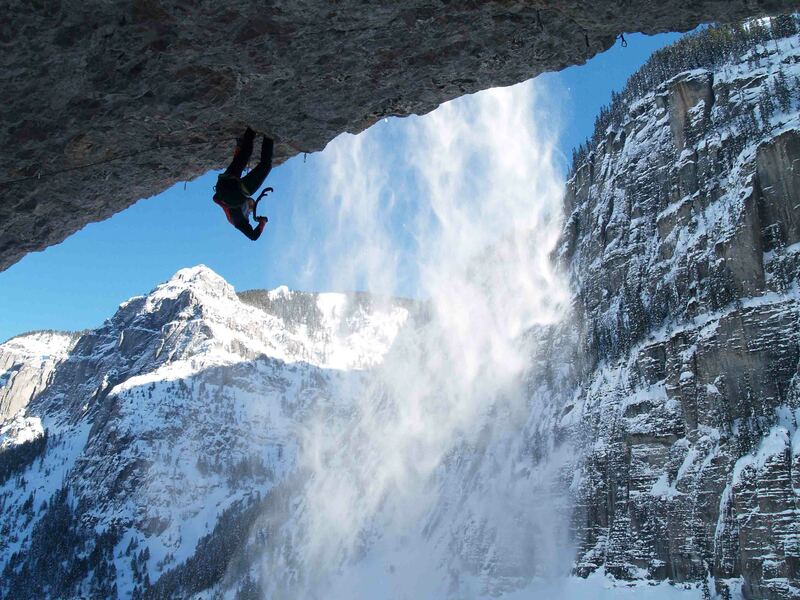 I think it’s also safe to assume Ouray also has more ice climbs per capita of any US city. Angelika Rainer on Careless Whisper, M11, The Remedy Crag. Most people enter Ouray from the north. The experience of weaving through the desert like sandstone canyons south of Montrose and popping out in Ridgeway at the foot of the San Juans makes your heart skip a beat. Lofty snow covered peaks striated with cliff bands rise uninterrupted for seven thousand feet from the valley floor. Interesting enough, a glacial carved u-shaped canyon, lined with red rock, forms a sort of red carpet to welcome the visiting climber. It’s not long before you spot ice high on the hillsides and soon it’s forming alongside the road as well. Rubber necking at the cliffs as you wind your way around the corners it’s all you can do to keep the vehicle out of the river. Then, the mountainsides curve away and an idyllic alpine town with hot springs lays before you. Welcome to Ouray! If you arrived from the south, than likely you’ve been white-knuckling the steep exposed corners and wondering why the hell are there no guardrails. Yes, that canyon is full of cars that didn’t manage to make that turn. Your first stop will likely be at the brewery and you’ll be more than ready for a drink. Jack Jefferies on Goldine, M10, The Posers Lounge. Being in the southern latitudes for an ice climbing destination, Ouray benefits from short but often sunny winter days that help to build and refresh the ice via melt/freeze cycles. That, and ice farmers are hired to keep the ice big and fat in the Ouray Ice Park usually from mid-December till the end of March. 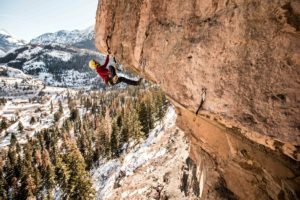 The coldest of cold days have highs around ten degrees Fahrenheit, but often temps are in the 20s and 30s making for pretty comfortable climbing conditions. Grant Kleeves on Fissure Out, M10, The Remedy Crag. Ouray is located in southwest Colorado, where we boast 300 days of sunshine, coffee shops, several nearby hot springs, legal weed, and enough microbrews you could probably try a new one every day. When the cold icy terrain no longer seems your thing, Moab and desert rock climbing are only a couple hours away. Oh, and then there’s the access. Yeah, I know the Canadian Rockies are sooo big and there’s sooo much ice, but waking up at 4 am and driving several hours day after day to climb sure does get tiresome. In Ouray, drive times feel long if you go all the way to Silverton or all the way Telluride, at about 1:15 minutes. Otherwise, a car isn’t even needed for many of the climbs. Once you get the area a little dialed, you might work from the Chocolate shop for a few hours, then many step out and rope-solo 10 pitches in the ice park which might only take about 2 hours and feel pretty content with your day. Kitty Calhoun at the Ouray Ice Park. As of initial release, this guide has over 300 climbs, and more on the way. In the future, I’ll likely add Telluride and Silverton and more obscure local routes as well. In the meantime, the areas along highway 550 including around town, and Red Mountain Pass are covered. 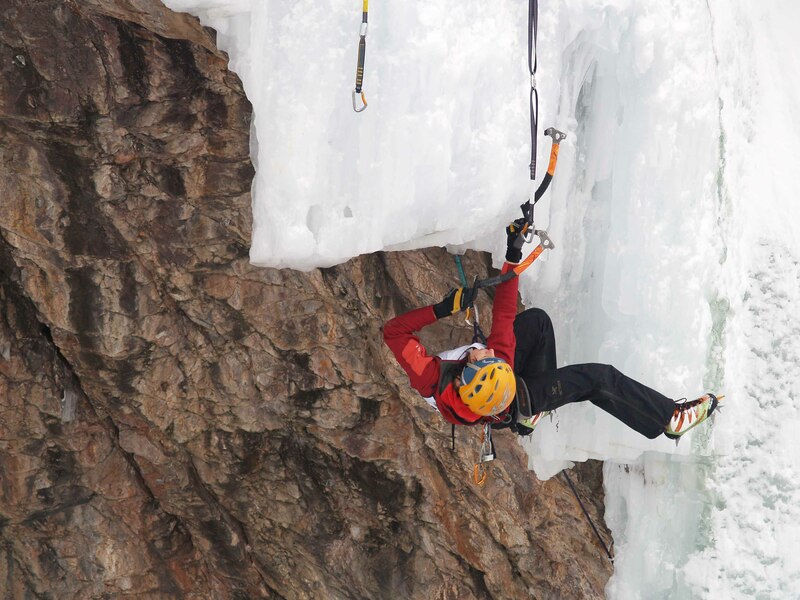 Of course, the Ouray Ice Park is covered and has some new climbs not previously covered in older guides. The scenic Camp Bird road or Canyon Creek Canyon (I never realized how redundant that sounded), is of course covered including Skylight, classics like the Ribbon and Bird Brain Boulevard, and the newer Hall of Justice. 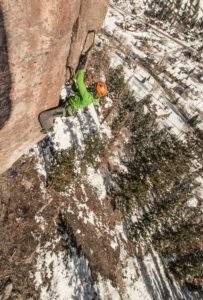 For those with overbuilt upper bodies and skinny little legs, you might enjoy the new Remedy dry-tooling crag that’s right in town. Viva Ouray! Learn more about Jason Nelson here.